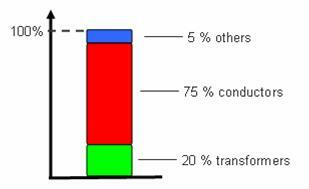 Do you realize that power losses in a electrical installation could represent up to 7 % of the electrical consumption ? Of course, low losses transformer can be used to reduce the energy dissipation, a study should then be done to assess the payback period. There’s also one rule that is sometimes forgotten during the design, it’s mentioned in some standards (French standard – NF – C15-100) or codes of practice: place the transformer and the main low voltage switchboard as close as possible to their load centre (centre of gravity of the consumers). Most of the time, you can reduce up to 30% the losses and consequently carbon emissions while using less cables that’s to say less investment costs. For example, the design in such a way for a food and beverage plant will save 120 k€ over 15 years and to divide almost by 3 the quantity of installed cables. However, it’s not always possible to choose the location of the transformer and the main switchboard because it’s sometimes imposed by the architect but this rule can also be applied to the sub-distribution boards, and contribute then to reduce the power losses between these switchboards and their supplied consumers. 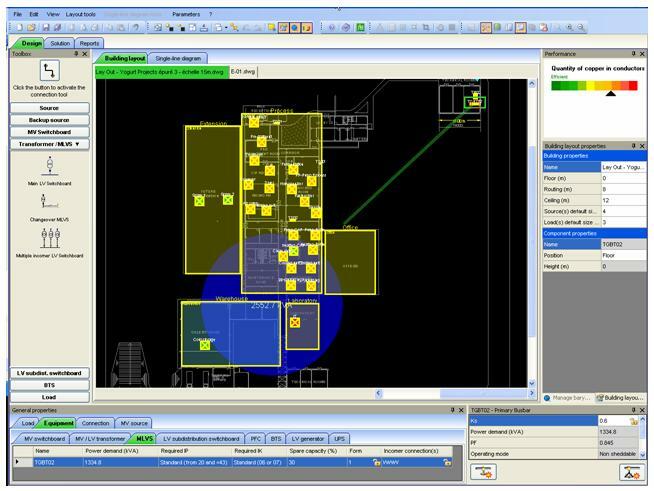 An electrical Software such as ID-Spec Large can help to determine the best location of the electrical equipment according to the implementation of the consumers on the CAD building layout (see the blue circle that represents the load centre of the MV/LV substation) and give an indicator of the quantity of cables during the design of the electrical installation. or copy this trackback: http://engineering.electrical-equipment.org/electrical-software/power-losses-reduction.html/trackback from your own site. i want all the latest forms of electrical operations. iam a student of EEE final year ….as iam very in need of subject knowledge,please make a note to me………. i need more details of of this topic as am a eee final yr student i want to aquire more knowledge on this……. CALCULATION OF WIRE SIZE ????? depending upon current rating we calculate wire size. can u suggest me topics related to electrical on which i can diliver a seminar. i want deep knowledge about power quality and active power filter for power quality improvement. factors affecting power quality, methods for improving power quality. I just joined this forum, I’m trying to help a company that is cumsuming 2/3 of power of the whole country. They manufacture metal. They take so much power they had to build the manufature right next to power plant! I want to investigate in how I can reduce power consumtion for them. Can you send me a link of that article or website. The cable size is increased depends upon the carrying current not voltage. In every high load added the capacitor the powerfactor will improve and to avoid more losses. If the load doesn’t have a compacitor I assume the will make the difference. What formula do I need to decide what type of compacitor that I need. Also, if the load has a compacitor already, can I add additonal compacitor parrallel or in series? Thanks for your imput. what do you mean ? which topic ? Jean, how about short cicuit capacity? become shorter cable Z become low and short circuit capacity will be high, did you consider about it because we should pay more for electrical device/protection that have higher short circut capacity. Reducing cable quantity leads also to reduce manpower and cable trays and this is usually a big part of the electrical installation cost. actually treating voltage regulator for loss reduction can be in both ways. It can help reduce loss but also it is a greater contributor to loss is misused. -energy efficiant transformers very closer to the MV panels. sir, i m kanwal singhal. i m doing a job . how to improve a power a power factor(pf).how to u solve a this problem .sir kwh and kvah note that reading and kwh/kvah after pf met a 0.79 ya 0.69 near abt but proper pf not met me 0.98 so please help me my phone is 09796209107. i m thankful to us.conductor(25 kvar) also used but no change pf . another way improve a pf .please help me . I Want to know about loss reduction in electric distribution network. you can start by reading this step-by-step procedure in reducing loss in electric utilities. could you please clarify “ogf”? In electrical networks, there are “power losses” in cables, transformers … because the electric current going through these conductors generates heat that is dissipated in the air. So part of the electric energy that you consume (and pay to your electricity provider) is just lost in heat dissipated, not used to power your loads. let me know about sump pump,and than how can i electrical control circuit. Could you please advice me on how to calculate a building load and how to specify a suitable stand-by generator for that building.Also how to calculate suitable cables and wires X-sectional areas..etc ? I’m to do a final year project on loss reduction in a distribution network using MATLAB/simulink . Ihave limited ideas however so I’m seeking some assistance. Possible idea is reducing losses by increasing cross section of coductors (cost analysis). Another one idea is reducing losses by reducing assimetry by phases (unbalanced load) – simulations what happens in four wire low voltage distribution system (three phases and neutral) – load and/or power factor unbalance. Third idea is connected with second idea – unbalanced load losses in three phase distribution MV/LV transformers with different vector groups for example Dy and Yz and assimetry transfer form LV to MV voltage level. If you need any further assistance, ask again! There are actual many ways in reducing the losses in an electrical system. To name a few, you can do this through load balancing, wire upgrades etc. Loss reduction in Electric Distribution Utility does not differ that much if applied to home and commercial buildings. hw the power losses in transmission line is reduced? i take this in my project? i do it or not mam or other research in e.e.e is i take ah? thereby eliminating many garden pests.